After rendezvousing in Johannesburg with my friends from Australia, we spent a night in a hotel that was distinctly reminiscent of Las Vegas in the 70’s. Funnily enough it was attached to the casino as well. The next morning dawned and everybody was in a high state of excitement – we are going on safari! Next stop Maun, Botswana. The Maun International Airport is a small, makeshift building that contains Customs and Immigration and Departures and Arrivals as all airports do. However in this instance, it is difficult to tell who is coming and who is going, who the officials are, and who the passengers are. A mass of humanity from all corners of the globe huddle in this small overcrowded room. The place is teeming with people of all colours and ethnic backgrounds and countries of origin – with one united purpose – to find a plane. Somehow out of this chaos we find our onward connection. We transit through the next security checkpoint and as usual, my metal knees (due to knee replacements) set off the metal detector. When I look up, the three male security guards look back at me in bewilderment and then at the machine and each other in surprise. I can read the looks on their faces and imagine what is going through their minds… “what the hell are we to do now? Pat down this woman? Ignore the metal detector? or, Call a supervisor?” They choose the path of least resistance, all looking at me with big smiles and say quietly under their breath…“ Please just move on”. I look into their eyes and I can see they mean … “please just go away and we will pretend that this never happened”. Gladly I move on and they turn their attention to the mass of people pressing to get through the gate. At last, we make our way across the sweltering tarmac to our plane – a single-engined 12 seater. As the engine revs up, the body of the plane starts to shake, the engines whine, people grip onto their seat belts and we are off. The excitement mounts knowing we are off into the Okavango Delta and the African bush where wonderful and exciting adventures await us. The 40-minute flight passes quickly as we fly over vast plains and lightly wooded ridges. Everywhere looks deserted. The vegetation is sparse and many trees are devoid of leaf and the ground is bare of grass. Occasionally there is a glimmering pool of water or a swamp with tracks leading to it from all directions. The shout goes up as we spot our first animals – elephants, giraffes and hippos dot the landscape. This is a foretaste of the amazing and exotic wildlife that we will see in the ensuing days. The plane slowly descends from 10,000 feet and the bush airstrip below is a ribbon of bleached white earth studded with huge clods of elephant dung. The pilot buzzes the strip a couple of times to make sure that there is no game that can wander onto the strip when he is touching down. Flying into elephant poo is one thing, but a whole elephant in the propellers would certainly cause a mess on the windscreen. We are met by our guide for the next three days – Gee. His big smile greets us and we are warmly welcomed in a truly hospitable African way. The hour long trip to camp takes us through dry savannah grassland which is punctuated by Camel Thorn, which is the stereotypical African tree. It has that signature umbrella shape with thick green foliage where the animals seek the cool shade in the heat of the day. It is a welcome variation against a dry, golden landscape of parched grass. Occasionally we cross swamps and streams where the water from the last rainy season. The Okavango Delta has two faces: dry and wet. The “dry” winter officially runs from May to October; and the “wet” summer from November to April. These oases of cool water are a respite from the ever increasing heat of the day. Many animals inhabit these pools permanently, whilst others make their way to them twice a day to quench their thirst. These pools and swamps are the lifeblood and beating heart of the Delta. The thirstiest of animals is the elephant. When really thirsty, they drink up to 120 litres a day. Apart from drinking water, they love the pools to bath in and to create mud baths where they spray themselves with a muddy slurry which acts as protection from biting insects and the sun. The elephants are majestic and amazing creatures and we are delighted to see so many of them and to study their habits and family life at such close quarters. • as their chewing teeth wear away, they are replaced from behind by a series of six in each jaw. Very interesting, Liz. I did not know anything about elephants. Hello Mary, Many thanks for your comment. 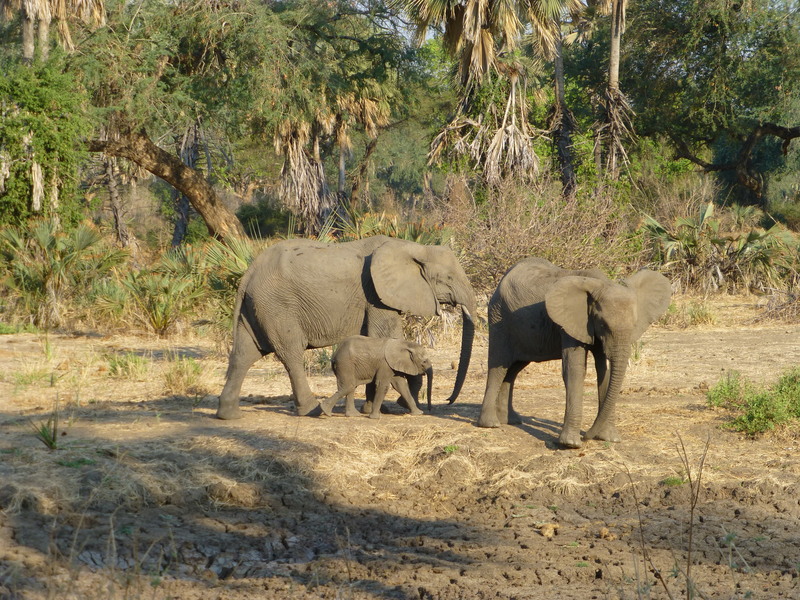 Elephants are fascinating and such a joy to watch – particularly the babies. Africa is better than Julia Creek any day!! !